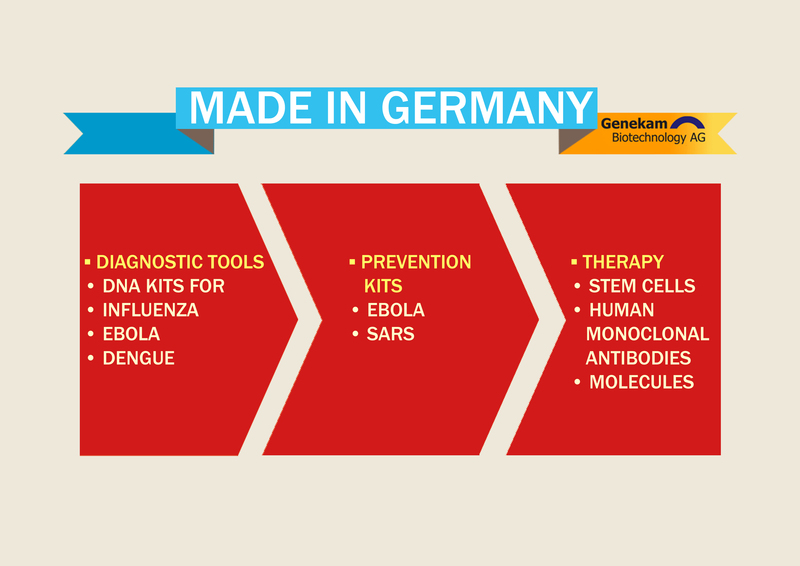 Genekam develops solutions for virology, stem cells and immunology. It has developed a large number of tools to acclerate the CAR T cell therapies. These tools are based on magnetic beads applications as well as molecular biological tools. It works on B-cells, where it is developing human potential therapeutic antibodies against pandemic viruses. Genekam focuses on Influenza viruses, where it has developed detection tools, small molecules and potential therapeutic pathogen specific humoral molecules (called also antibodies in literature). It manufactures a large number of products to be used in diagnostics. It has developed products to removal of endotoxins and nucleic acids from Solutions to create highest Quality Proteins to be used as therapies.Circulating Tumor cell isolation kits based on magnetic beads. Next Generation isolation tools are being developed. Genekam manufactures products, which will lead to cheap diagnostic and therapies. They are developed on basis of strong knowledge from hundreds of publications, for which thousands of scientists around the world did excellent research along with experience of Genekam Biotechnology AG. The kits are carefully developed that they are highly specific, accurate and sensitive and are validated with related and non-related real targets. The kits are developed and produced under Quality Management, which builds the CE-IVD basis for approving the diagnostic kits later on. They are standardized, hence they can be used from different groups working on the same pathogen e.g. Influenza A. The laboratories can use Influenza A kit (Fluhunter) to compare and standardize their own routine work and they can compare their results. 2. They are simple to use and easy to store. 3. A user, once worked with one kit, he knows how to work with other kits of Genekam Biotechnology AG. 4. Kits are developed from the persons, who have deep knowledge of medical microbiology particularly virology. They come from medical field, where they conducted research for a longtime. They work only in the fields, where they have experts. These are immunology, stemcell research and microbiology. Genekam kits are manufactured according to medical point of view e.g. how to use them, how to read the results and how to reconfirm the results. 5. Many institutes around the world are creating their own solutions rather trying the advantages of Genekam kits. Many institutes think that they mix mastermix and primers, it is their PCR. The good quality PCR kits are very complex to develop and need long experience to develop and manufacture them. Moreover these institutes never able to make the kits, which Genekam is able to offer. Genekam kit have constant and stable quality. They are made under environment that they are free of any contamination against the in house made kits, which are made under laboratory conditions and they are being used in diagnostic as well as monitoring, hence it is likely that many of results are prone to be wrong. The cost of in house made kit is much higher as many institute never calculate the time (labour cost) used to develop their assays and the time needed to run the assay. If these factors are taken in account, they are more expensive and more liable to give wrong results. Further once the person, who is developing in house kit, leaves the institute or gets sick for a month. This will cause harm to the institute as there is no body, which can substitute this person. The kits of Genekam Biotechnology AG are becoming economical and the prices are droping further, if the Genekam gets more orders. Therefore it is not economical and waste of sources. 1. Genekam PCR kit can be used to do conduct the studies to do prevalence of a particular pathogen. Such studies have been done in some of institutes around the world e.g. Iraq, USA. Some of institutes conducted the studies of prevalence of HCV viruses in their populations as well as HCV genotyping. Such studies can be conducted in other areas around the world in order to take preventive measurements. These monitoring studies can be done as Master or Ph.D. thesis. There are some viruses circulating around the world. In order to develop preventive measurements as well as therapies, one should know the prevalence of a pathogen. Studies can be conducted for pathogens e.g. Middle east SARS virus, Ebola virus, Influenza viruses in the wild life and human population. The cost of such studies using Genekam kits is not so expensive e.g here is one calculations Studies of Influenza viruses H5 in poultry in Africa or other parts of the world, the costs will be Euro 600 for 100 reactions + 100 Euro shipping + 250 Euro RNA isolation + 100 Euro other costs = 1050 Euro for one Ph.D. Thesis. These studies are important for the world to know the presence of Influenza viruses. It is highly recommended that such studies can be conducted for HCV genotyping in Oman, China, Qatar or Thailand in order to find which genotypes are prevalence in these areas as HCV genotype is an indication of success of the therapy. Such studies should become the part of each medical college. It was never so economical to conduct the studies. Further studies are needed how the dengue viruses exist during the whole year in the mosquitoes and which are their hosts in many countries. Such studies can be conducted with Genekam PCR kits. The results about dengue viruses may provide some answer how to control the spread of these viruses, once one knows their way of presence in hosts. Many outbreaks could have been controlled earlier, if there is regular monitoring of many viruses. 2. To develop the new vaccine, Genekam PCR kits can help to find of the virus strains needed for development of a new vaccine. During the vaccine development, one can use Genekam kit to develop and find the potencies of viruses in cell cultures. Genekam PCR kits can be used to control the quality of the components of vaccines e.g. fetal calf serum is contaminated with other pathogens e.g. BVDV, Riftvalley (if it is coming from prone areas). 3. Genekam PCR kits can be used to find other pathogens being transmitted during the blood transfusions rather than the standard parameters e.g. HCV, HBV, HIV. Such work can be done as Master or Doctorate thesis around the world. Later on these work can be implemented as recommendation for blood transfusion e.g. during the dengue virus outbreak, the blood to be transfused, should be checked for dengue virus presence. Such evidences can be found through conducting studies. In USA, screening of west nile virus is essential for blood transfusion as USA conducted huge studies to find this fact. It means that in future, there is a need to conduct the monitoring of other pathogens to define screen parameters on the basis of pathogens prevalent locally. 4. Stem cell therapies are booming in countries like China, India, Korea, Thailand and many countries, but there is strong lack of biological safety of these products. There are many ways of getting pathogens during the stem cell therapy e.g. a donor comes from ebola prone area and it is latent carrier of this pathogen or during the processing of stem cell in laboratory, there is contamination through the handling or cell culture media. To control such contamination, one can use Genekam PCR kits. We need here also studies around the world so that one can develop prevention measurements. Regretfully one cannot autoclave the stem cells. Similarly there is need of monitoring for other cellular therapies e.g. T-cell, B-Cells as well as Dendritic cells. 5. There are regular outbreaks of food pathogens going on the world. Genekam kits can be used to monitor these pathogens as it is simplest and economic way to reduce the food poisoning. 6. Genekam PCR kits can be used to develop new therapies e.g. human monoclonal antibodies. These kits can be used to control the cell culture contaminations as well as quality of components. 7. The cosmetic industry should apply Genekam kits to control the quality of their components as many of cosmetic components are of animal origin, hence they can be source of infection. 8. Genekam PCR kits can be used in Pharma industry to control the quality. 9. Genekam kits can be used in food industry to find the kind of the meat being used in food products. In the past, there was a big scandal that horse meat is being sold instead of beef. Such studies can be done in other countries too to find the purity of meat being used. 10. Genekam PCR kits can be used to detect the infected as well as latent carriers in animals and poultry in this way one can maintain healthy stock and reduce the economic losses.